Barely a week has passed since we published “Don’t talk about my potholes stupid”, and no one expected the presidential axe to fall so quickly and so decisively. Latest news from State House is that president Koroma has sacked both his minister of works and close friend – Alimamy Petito Koroma, and the Director of the country’s road transport authority – Munda Rogers. These two state officials are two of the richest men in Sierra Leone, with assets worth millions of dollars. They are both responsible for procuring and overseeing all road construction and maintenance projects in the country, which since 2007 is valued at more than $400 million. The European Commission alone has in the last five years provided funding of over $200 million for infrastructure development in Sierra Leone. Is the president now getting tough? In 2010 the African Development bank commissioned ‘an independent’ accountant to audit the accounts of all funded road construction projects in the country. The results of the audit have never been published. But as we published last week, public outcry against the road transport authority and the ministry of works must have certainly reached deafening levels for the president. The unacceptably poor performance of both agencies could no longer be glossed over by president Koroma, hence his decision to act decisively by sacking Petito and Munda, despite their close relationships. “In the past few weeks, several meetings were held at State House to review our infrastructural projects. “The outcome of these meetings has left His Excellency the President with the conclusion that the Ministry of Works, Housing and Infrastructure, and the Sierra Leone Roads Authority have not proved themselves equal to the task of managing the implementation of the road projects. Whilst this is as tough as we have ever seen from the president, who has become very well known for his dithering and lack of conviction, it must be said that he has today made a very brave decision, which must send a strong signal to the rest of his under-performing ministers, that enough is enough. With this decision, the president is telling his cabinet ministers that he will no longer continue to tolerate poor performance from those whom so much is expected, in the delivery of good governance in Sierra Leone. In July 2013, president Koroma launched his new Agenda for Prosperity, which sets out his government’s plan for the next five years, aimed at alleviating poverty, improving economic growth and continuing his programme of infrastructure development. But three months on, there are worrying reports of the emergence of internal strife and political struggle at the heart of the Koroma government. Several ministers have openly declared war on each other, as the battle for leadership of the ruling APC party begins to get ugly. This war of words has now created an environment in government, whereby several ministers are refusing to turn up for work. They are instead focusing their attention and energy on establishing their personal enterprises, especially the construction of houses and business premises in anticipation of their retirement from politics in 2018. But the waging of ministerial warfare in the corridors of State House, is seriously hurting the president and does not bode well for the delivery of the highly ambitious programmes set out in his Agenda for Prosperity. 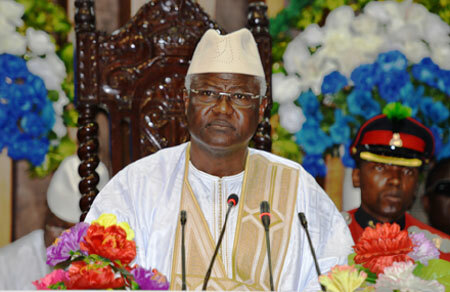 In 2010 president Koroma declared that 2011/2012 will be the year of infrastructure programme implementation. And indeed in 2012, pro-government media ironically described several parts of the country as resembling “a works yard”, with dozens of major roads and streets destroyed by decades of neglect and the civil war, undergoing reconstruction. But according to various evaluation reports, the pace and quality of infrastructure project implementation is seriously being hampered by inadequate resource capability and poor governance. This current catalogue of ministerial mutiny and departmental dysfunctionality is not only bad for the country’s image, but disastrous for the much needed foreign investor confidence. Sierra Leone needs all the help it can get, but it seems government ministers are now unwittingly undoing the very little success that has been achieved in the last five years by president Koroma. But many would say that the president has only himself to blame for the continuing poor performance and unprofessional behaviour of ministers. Had he published the ministerial contract performance review report he promised in 2008, he would have clearly shown those taking up ministerial office that, underperformance will not be tolerated. It is believed that over 70% of president Koroma’s ministers are not only underperforming, but obscenely corrupt. Munda Rogers, Director General of the SLRTA has failed to achieve his objective. The people of Sierra Leone are sick and tired of the increasing number of potholes and craters appearing on newly constructed roads, while promises of resurfacing older networks remain unfulfilled. Today, president Koroma has shown that he can be decisive and swift in dealing with the so called sacred cows in his government, but he must now begin to demonstrate consistency in leadership and commitment to good governance, if he is to be remembered for all the right reasons. Will president Koroma now turn his axe on the poor performing Director of the country’s electricity supply corporation – NPA?